A main feature of many logics used in computer science is a means to express quantification. Usually, syntactical devices like variables and quantifiers are used for this purpose. In contrast to that, in conceptual graphs, a single syntactical item, the generic marker ‘*’ is used. Nonetheless, sometimes conceptual graphs with variables have to be considered. If the generic marker is replaced by variables, it has to be investigated how this syntactical difference is reflected by the semantics and transformation rules for conceptual graphs. 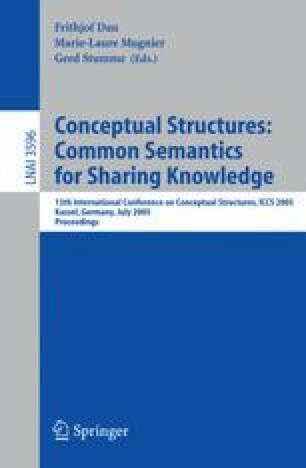 In this paper, this task is carried out for the system of concept graph with cuts (CGwCs). Two different classes of CGwCs with variables are introduced, and for both, a semantics and an adequate calculus for CGwCs is provided.